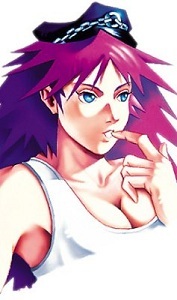 Poison Kiss is a character of the Final Fight series. She debuted as a enemy in the Final Fight games, and was playable for the first time in the Sega Saturn 3D Fighting Game Final Fight Revenge. In Street Fighter III and SNK Vs capcom she accompanys Hugo but is not playable.